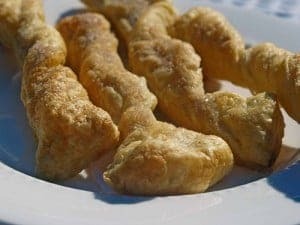 Home » CopyKat Recipes » Make light and flaky Cinnabon Stix at home. Cinnabon Stix – Have you ever been walking through the mall and dared to walk by Cinnabon? For me the pungent scent of cinnamon wafting through the air is simply irresistible. If you can ever make it past their delicious cinnamon rolls, you may notice that they have light and crispy Cinnabon stix. The Cinnabon stix are a light and flakey kissed with the delightful flavors of cinnamon and sugar. These make a perfect breakfast or even a dessert. Cinnabon Stix are delicious snacks to make. This is one of the few recipes were I call for parchment paper. Parchment paper can be found in many grocery stores. When the cinnamon and sugar crystallize in the oven, they become sticky. I personally hate doing dishes, so to prevent myself from doing a lot of scrubbing; I suggest that you use parchment paper. Packaged puff pastry dough can be found in the freezer section of your grocery store. I have typically found this near where pie shells are sold. For defrosting the puff pastry dough, follow the instructions on the box. Do not leave this over night in your refrigerator to thaw, thinking it may save you time. You will end up with a sticky and hard to separate lump of dough. Food courts are a wonderful place to hang out; you are in the center of many different choices of tasty food. I miss the old Corn Dog on a Stick places, there is something about a corn dog that dipped and fried before you. Do you have any favorite foods that are served in shopping malls? Want some more cinnamon goodness? Look what else you can do with puff pastry. Make the Cinnabon Cinn-a-Stix at home. Allow package of puff pastry dough to defrost according to manufacturer’s directions. Preheat oven to 350 degrees. In a small bowl combine together the sugar and the cinnamon, mix well. Open puff pastry dough and use one sheet and unfold onto a clean counter. Unfold the dough to where the long side is towards you, puff pastry dough is rectangular. Spray puff pastry dough with non-stick spray (do this so the cinnamon and sugar mixture will stick to the dough), and sprinkle on 2 tablespoons of the cinnamon sugar mixer on the dough. Using a pizza cutter cut the dough in half horizontally. Cut the dough vertically into 10 pieces. Twist each cut piece of dough 2 to 3 times before placing onto the parchment covered cookie sheet. Sprinkle an additional 1 tablespoon of the cinnamon sugar mixer. Repeat process with other pastry sheet. Bake stix for approximately 15 minutes or until desired toasted color. Prepare icing by allowing margarine and cream cheese to reach room temperature. Beat cream cheese and margarine together in a bowl with a mixer. Slowly add in all powdered sugar and lemon juice, and vanilla extract. Serve with Cinnabon Stix.